What type of Water Damage Has Affected Your Home Or Business? We Customise The Restoration Program To Cater For Your Specific Situation. At Capital Restoration Services we will manage your water damage clean up and restoration program according to the source of the damage and the class of water damage affecting your home or business. There are three key sources of water damage and the restoration process differs for each one; as outlined below. White Water Damage: White water is clean water that does not generally pose substantial harm to humans. It is usually water from running taps, burst pipes, heavy rain and other clean water sources. Generally white water damage requires water extraction, drying of water damaged and wet carpets and other surfaces and humidity control to ensure there is no excess moisture around to cause future problems of mould and mildew. Furnishings and other items on wet carpet and other wet flooring will be removed or raised to protect them from the water. Water damaged floorboards are checked to see if they are cupping and if necessary replacement is organised. Grey Water Damage: Grey water is usually unsanitary and has a level of contamination. Examples include grey water from washing machine and dishwasher overflow, toilet overflow (urine only). This type of carpet water damage or flood requires immediate attention as water contamination will be activated further by time and temperature and may change its condition to black water which is unhealthy for humans. The make safe, cleaning and restoration program for grey water damage is similar to the white water damage restoration approach, with the addition of the treatment of bacteria and the necessity to steam clean carpets once they are dry to remove any contamination and staining. Black Water Damage: This tends to be from sewage overflow (faeces) and ingress from roofs. Black water is contaminated and unsanitary. 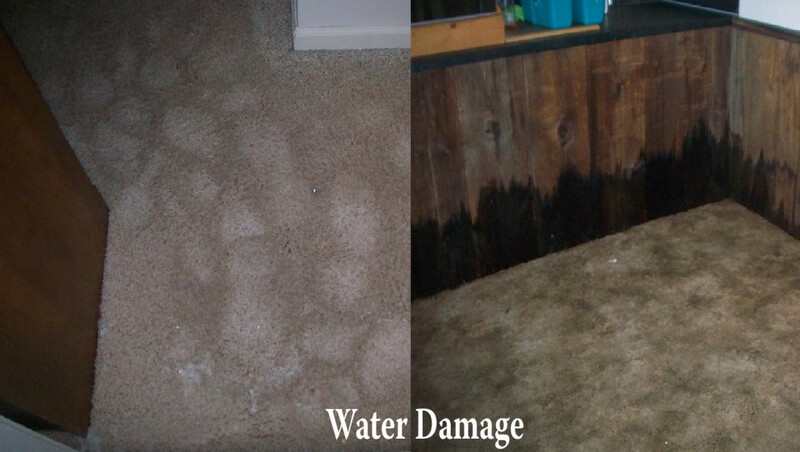 This type of water damage requires all surfaces to be treated to eliminate any bacteria from spreading. The affected carpet and other structural surfaces tend to be cut and removed and then restored once the drying process is completed. Each of the three different categories of water damage and is treated differently during the water damage clean up and restoration program. However, all types of water damage should be treated quickly to avoid the condition of the water changing and causing further damage. The class of the water damage is also important and depends on the level of exposure to water and moisture and the level or permeance/porosity of the material affected by the water damage. These factors will determine how quickly the water damage spreads and wicks up walls and penetrates other surfaces. At Capital Facility Services our certified and experienced Water Damage Restoration Technicians will assess your situation using specialised equipment and monitors to gauge the category, class and degree of water damage and will then manage a restoration program according to the IICRC guidelines. So you can rest assured you are dealing with experts that have a combined experience in this field of over 40 years.